Santorini is well-known for its incomparably beautiful and breathtaking sunsets and a vivid, unparalleled life during the summer that many people don’t look for anything more than that. However, Santorini is a lot more than sandy beaches and an unbelievable view from your hotel’s balcony. Santorini has a strong, long-lasting legacy of winemaking, producing some of the most amazing wines in the world, with a reputation many wineries would be jealous of. Is it the soil? Is it the grape varieties used? Is it the technical know-how that the local winery (or “kanava” as wineries are traditionally called on Santorini) owners have accumulated over the years? Or is it the incredible atmosphere that makes the wine taste that great? If you asked me, I’d say it’s all those things that make these wines one-of-a-kind, the perfect addition to your lunch or dinner or your go-to drink when hitting the bar at night (even throughout the day…). The million-dollar question is now: “which are the best wineries of the island, where I can experience these magnificent tastes?” and we’ve found them for you. Located in the village of Megalochori, Gavalas Winery is one of the oldest wineries of Santorini island and produces some of the best wines made from varieties planted on an 18-acre vineyard: Assyrtiko, Athiri, Aidani and several rare local varieties of Katsano, Gaidouria, Mavrotragano, Voudomato. The winery is known for its Vinsanto wine, which has been awarded the title of the “Best Dessert Wine” in the world, a naturally sweet, magnificent wine from sundried grapes of the varieties Assyrtiko, Athiri and Aidani. The quantity produced and bottled each year is limited, making it one of the most valuable wines out there. Their motto is Collectiveness, Quality, Authenticity, Sustainability and this is exactly what they offer through their products. SantoWines is the Union of Santorini Cooperatives and was founded in 1947, counting 1,200 members. It represents all the cultivators located in Santorini and its main mission is the promotion of all Santorini products of highest quality and based on practices of sustainable agricultural development. Their winery is located in the village of Pyrgos, which was completed in 1992 and is considered one of the most modern wineries in Greece. The SantoWines winery offers white, red and rose wines, semi-dry, semi-sweet and sweet ones, and more. Whatever you do, don’t forget to brace yourselves for an unforgettable wine experience! What was previously a tomato processing factory was reconstructed and converted into the most industrial winery of Santorini island. Gaia Winery was founded in 1994 and is located on the eastern side of the island, between Kamari and Monolithos settlements. The winery produces some of the most exquisite wines of the Assyrtiko variety, such as Thalassitis, Thalassitis Oak Fermented, Assyrtiko by Gaia, and Vinsanto by Gaia. In the small oxidization area set up in the facilities, Gaia Winery produces its aged, aromatic Assyrtiko vinegar. The winery is open from May through October for you to see all the winemaking process followed for the production of the wines. Visit Gavalas winery, SantoWines and Sigalas winery in an Afternoon Private Wine Tour. Named one of the best small wineries around the world, Sigalas Winery was founded in 1991 and, since then, the winery has been growing and expanding its facilities with a winemaking process that produces wines exported to Europe, Hong-Kong, Shanghai, Singapore, Australia, Brazil, USA and Canada. As most wineries on Santorini island, Sigalas Winery produces wines made from different grape varieties, the Assyrtiko, the Aidani, the Mandilaria, the Mavrotragano and the Athiri variety, rich in flavors, distinctive perfume and extraordinary after-taste, depending always on the winemaking process. The winery is open throughout the year and the times vary with a series of different events organized by the winery and offered to those of you interested in visiting and taking a tour combined with an unparalleled winetasting experience. 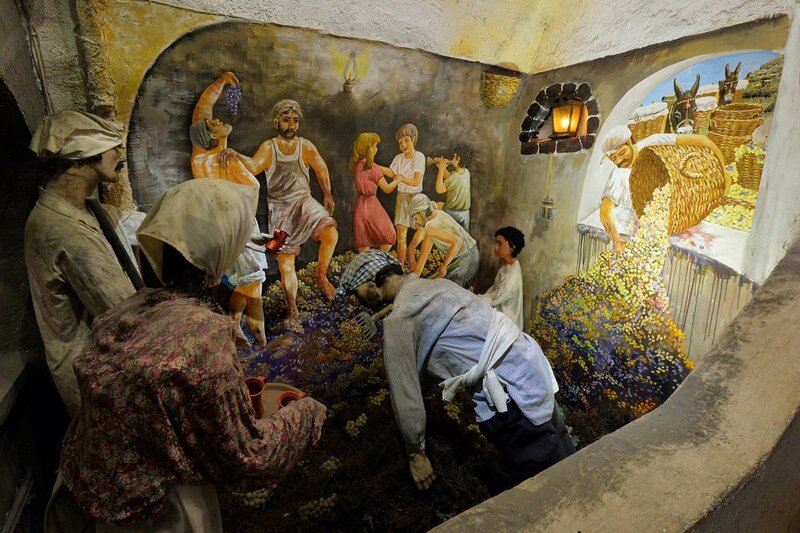 Founded in 1870, Koutsoyannopoulos Winery is one of the oldest wineries of Santorini, which also operates as a wine-centric museum, located 8 meters below the surface in a cave-like area, where you can learn everything about the history of wine and winemaking and where you can navigate through the history of the wine culture of Greece in general, and Santorini more particularly. The winery is well-known for its wines, especially the Santorini Assyrtiko Koutsoyannopoulos (White dry), the Ampelones Koutsoyannopoulos (Red dry), the Kamaritis (10 years old, Dessert) and the Vinsanto (3 years old, Dessert). The winery is open during specific opening times (which you can find here) and may be visited all year long. The winery made its first winemaking attempt in 1997. Since then, Hatzidakis Winery has been working restlessly to produce great wines of high quality and with the best varieties the area has to offer. At an altitude between 70 and 350 meters, the vineyards are cultivated with plenty varieties (Assyrtiko, Aidani and Mavrotragano) based on the principles of organic farming, which makes the winemaking product an even better and tastier result. Explore the island of Santorini and visit 3 of its best wineries in our private tours. Visiting Santorini can be so much more than simply enjoying your holiday on the beach or at the local restaurant and bars. With the endless vineyards and wineries available on the island you can experience Santorini to its fullest, learning about its winemaking history, which is a significant part of the island’s history, while at the same time lying under the sun, swimming in the crystal-clear waters and tasting local specialties in restaurants and tavernas. A wine experience at its finest! Did you like our post? Pin it and save it for later! 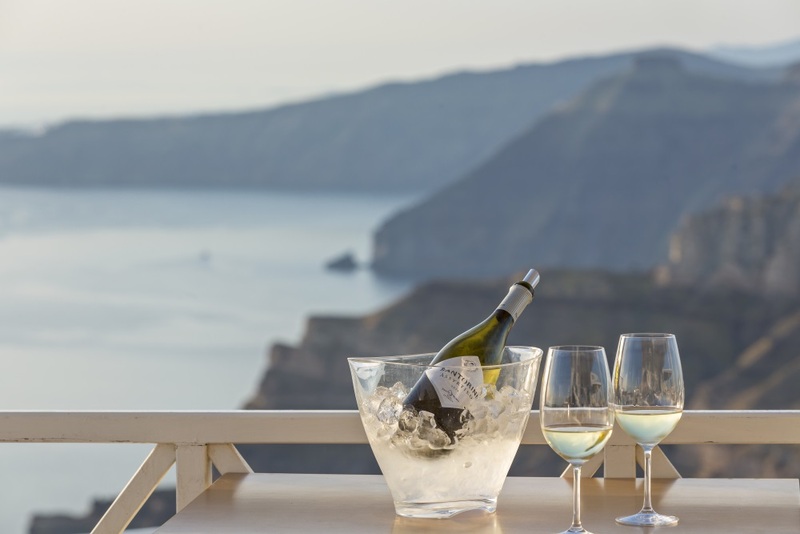 Have you ever tried the wines of Santorini? What are your thoughts? Let us know in the comments section below!